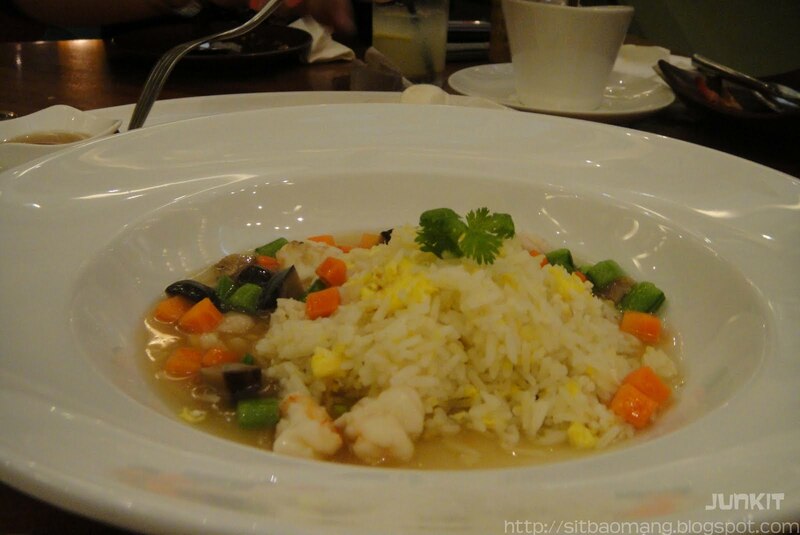 Recently, Starhill Gallery offered a very attractive promotion whereby you could dine at 4 of it's restaurants for only RM3.60 per dish! No writing mistakes here, RM 3.60, cheaper than any Mcdonalds meal! From the promotion link, 4 restaurants are having the said promotion which are; Shook!, Fisherman's Cove, Luk Yu Teahouse and Pak Loh Chiu Chow. Few of us curious one gathered and gave Shook! a try, well, mainly because we couldn't really afford it normally and thought why not given that inclusive of tax, each dish cost only around RM4.00+. The few chosen RM 3.60 dishes to be selected. Looks good huh? Going to be honest here, looks are the only thing that are good here. 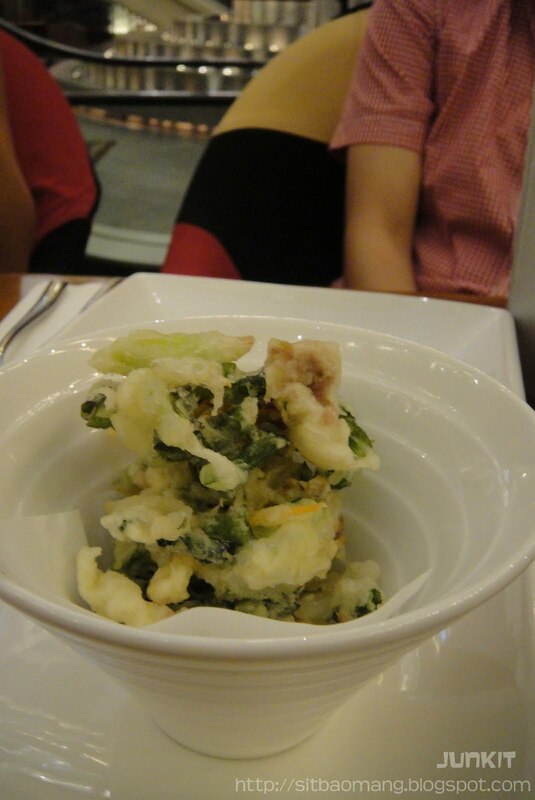 The 1st dish arrived and hell, we tried to keep ourselves from laughing hardly out of the waiter's sight. The servings was HUGE; which in HUGE i was meaning only the plate! I guess that's the quantity you get given the price, acceptable. Now don't get me wrong. I'm absolutely ok with the quantity, but quality wise, I'm not so sure if they do retain their normal quality. Dry, cold and no olive oil aroma at all. Failed one. The only savior of it was the prawns. 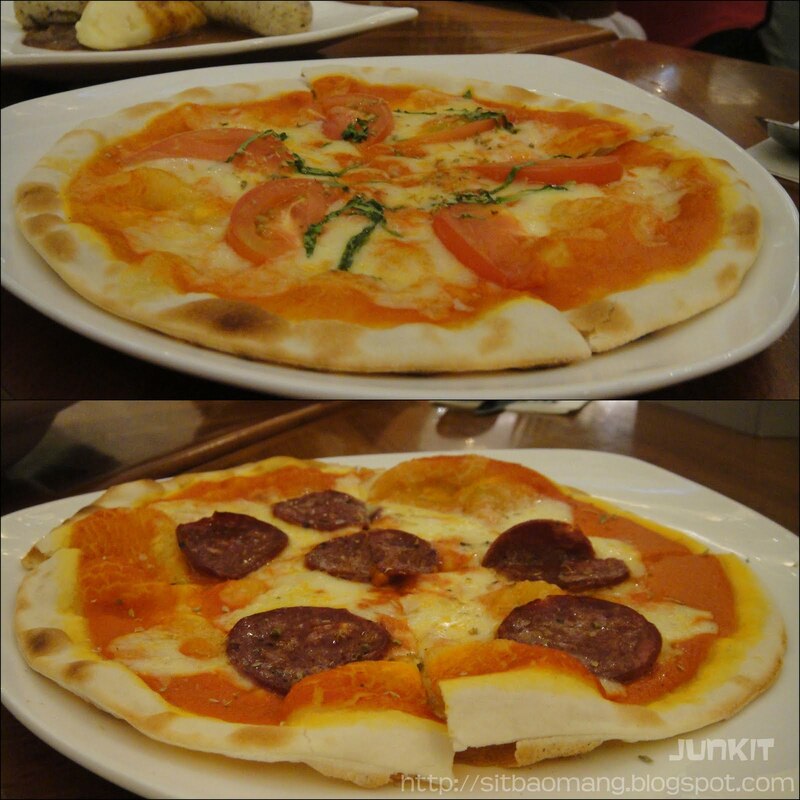 The pizzas were ok. Thin crusted resulting in quite a crunchy texture. The pepperoni somehow felt a tad bit dry to my liking. Deep-Fried Seafood Fritters with Chili Dip. Damn, I thought I remembered wrongly from the menu. 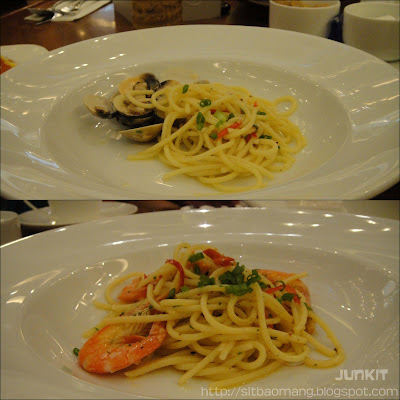 I remembered this is a seafoood dish. SO WHERE ARE THE SEAFOOD? Taste and look more like Vegetarian Fritters. Pffft. Prawn Cocktail with Spicy Japanese Dressing. This is nice. At last! 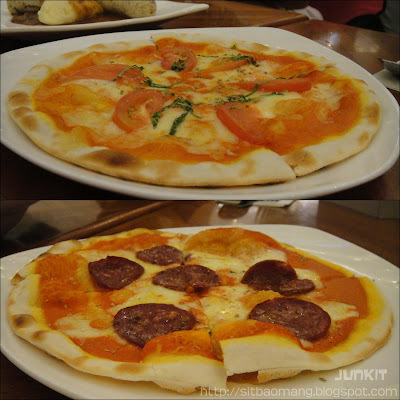 Thank god, a nice dish at last after 3 bad ones. 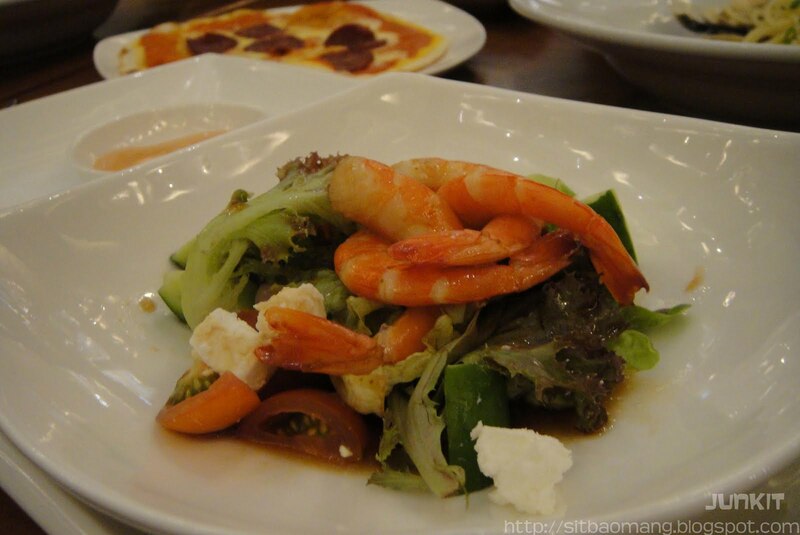 The prawns were fresh and sweet, the wasabi-soy sauce dressing was good and has these pieces of cheese. Refreshing! 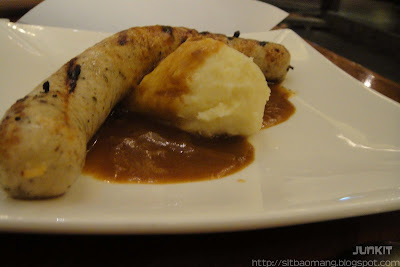 Grilled Cumberland 8 inch Sausage with Mashed Potato and Onion Sauce. Now this is good too. The sausage has this nice bouncy texture and grilled perfectly. Herb bits and flavors are the first thing to be detected once you sink your teeth on it. 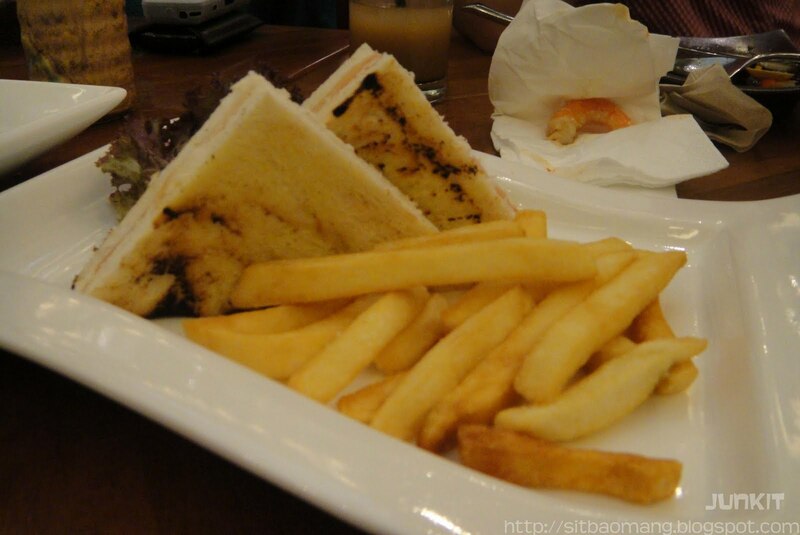 Grilled Chicken and Ham Sandwich with French Fries. Did not taste the sandwich, but the fries was a let down. Cold, hard and basically tasteless. 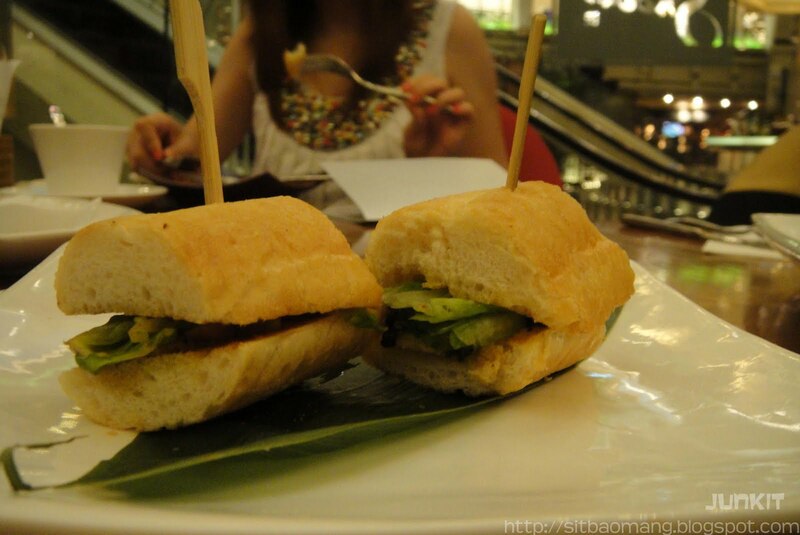 Chicken Teriyaki Sandwich. The bread was sure HARD and dry. Hmm, might be better if toasted as it's not that fresh anymore. The teriyaki chicken was ok. Fish Tempura with Somen. 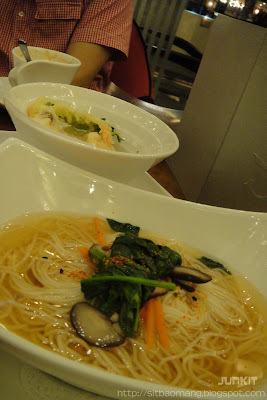 The somen was good, smooth and silky, something like the Chinese's Mee Suah. However, the soup was BAD. Basically tasteless and I could only conclude that it tasted more like water rather than soup. Nothing extraordinary about the fish tempura though. 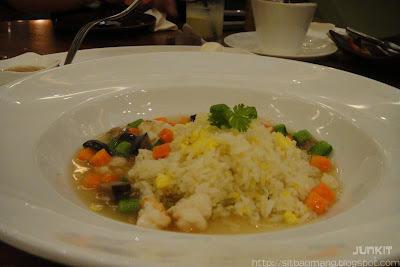 Cantonese Seafood Fried Rice. Out of curiosity, we ordered something Chinese just to try. It was a disaster. The visual appearance had already failed in my opinion. The taste? Worse then how it would look. Lack of 'wok hei' (the 'essence' and taste that is achieved through high heat and oil combination cooking - a very important and must aspect in good Chinese cooking), not fragrant at all and sticky rice. And what's with the tasteless starchy gravy? The most failed dish of all I would say. That just proves that my theory is right - good Chinese food with good wok hei is never eaten at posh places. 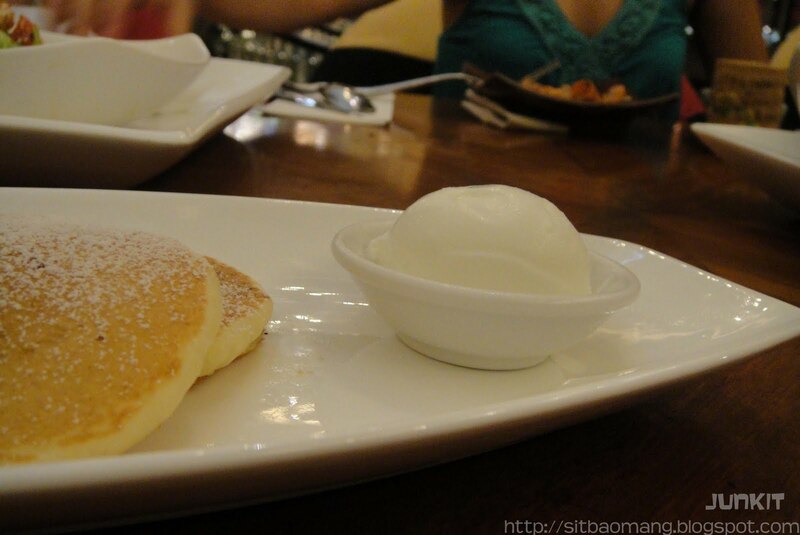 Banana Pancake with Maple Syrup and Baskin Robbins Ice Cream. Could taste banana flavors in every bite of the pancake. Lol. The ice cream (vanilla I think?) and maple syrup goes very well with the pancake. 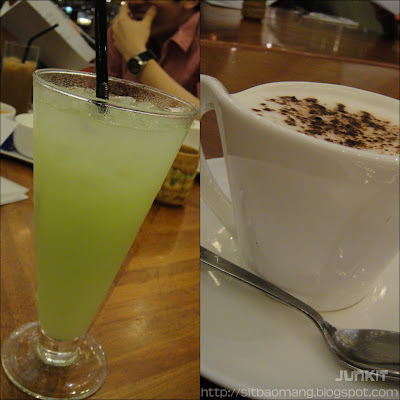 Some guava juice and cappuccino to go with the food. 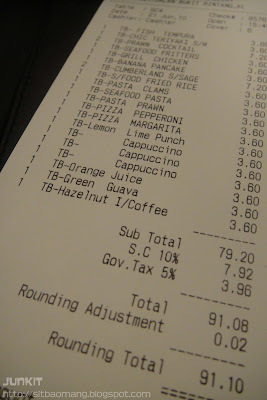 Drinks are also at the same price as the food - RM 3.60. The total bill came up to RM91.10 for the 7 of us. 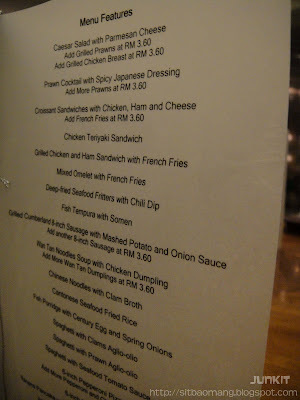 RM13 per person is not bad, considering that we sample almost everything from the menu. But would I return? I would say yes if I were to sample the food from the other 3 restaurants. No, to Shook!. In my opinion, if you were to promote a sampling period for a cheap price for promotion purposes, it is pretty acceptable to cut down on the quantity. But cutting down on quality, a big NO for me. I'm sorry but Shook! has just lost it's' reputation in my dictionary. Shook! is located at the lowest ground (Feast) and is visibly seen from the open area of every floor near the lifts. Easily recognizable from the live bands that are always on show. 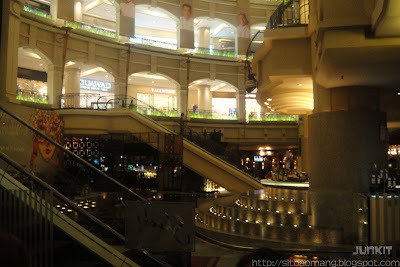 Starhill Gallery's RM 3.60 promotion runs daily till 30th June 2010. So if you do want to just taste preview or maybe have some really affordable cheap tea session, head over. By the way, parking for Starhill Gallery is RM2.50 per hour before 6pm on weekdays. Address : LG1, Feast Village, Starhill Gallery, 181 Jalan Bukit Bintang, 55100, Kuala Lumpur. Price: RM 3.60 for every dish till 30th June - promotion. Update: There are rumors that the promotion is extended till an uncertain date. Do be safe and call first before heading though. I really liked the sausage too! But eh? You got vanilla ice cream that day - I got chocolate... Still looks good tho. i just finish reading another review on this 3.6 tea break,some ppl said it is still available after 30 of june. i am not sure this it true or not,if you guys hav the info pls let me know yea..
Hey there, you are partially right. From very reliable sources I got to know that the promotion actually extended but still unsure till went. Some say there's no ending time for it lol. So just to be safe, do call Shook! or any restaurants first before going; can't seem to find any updates on their website though. Our previous specials for August and October were exciting and successful. Many of you took the chance to write more and earn more, and many of you asked for more specials in the future. We listened to your suggestions and heard some great ideas for new specials. [url=http://www.fluke.co.kr/UserFiles/Image/moncler/moncler-solde.html]moncler solde[/url] post cycle therapy can be done effectively with more drugs, such as clomid or human chorionic gonadotropin, or you can do it with over the counter nutritional supplements. For arguments sake, let's say you've decided to go the supplement route. You want to focus on supplements that will help you get your natural testosterone levels up and moving once again. [url=http://www.fluke.co.kr/UserFiles/Image/moncler/doudounes-moncler.html]doudounes moncler[/url] Before you can replace the old soles, you must remove them. Normally, bootsoles are either sewn or glued. If they're sewn, there will be threads visible around the upper edge of the sole. Examine the soles for attaching screws or nails in the heel; remove any fasteners with a screwdriver or a nail puller, and save them to attach the new soles. [url=http://www.fluke.co.kr/UserFiles/Image/moncler/moncler-france.html]moncler france[/url] Marchio di lusso italiano Moncler recentemente quotata alla Borsa di Milano ufficialmente presentare il modulo di domanda , elencando due anni fa per riavviare il programma entro la fine di quest'anno si prevede di IPO . Si dice che nel giugno 2011 , Moncler aveva cercato di mercato , ma poi a causa dei francesi fondo di private equity Eurazeo per acquisire il suo 45 % del capitale, il prezzo ragionevole rispetto al mercato , in un momento in cui la crisi del debito europeo Ã¨ appena iniziata , il mercato italiano non Ã¨ stabile , cosÃ¬ Moncler accantonato IPO piani .